The MOSSAR Color Guard is shown here participating in a Naturalization Ceremony by the Independence Pioneers Chapter, located at the Harry S. Truman Library in Independence, MO on September 17, 2007. 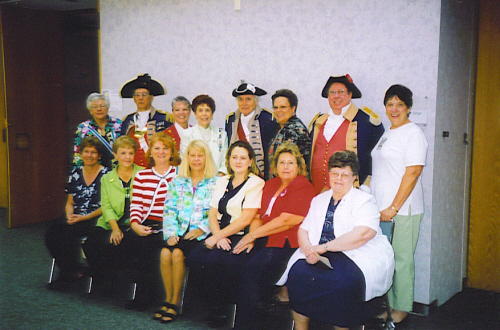 Front Row: (L - R) Unknown, Fran Mason, Susan Bowman, Independence Pioneers DAR Regent; Bonnie Dickson, Unknown, Linda Schrt, and Carolyn Franklin. Back Row: (L - R) Mary Lynee Tolle, MO DAR State Regent; Major General Robert L. Grover, MOSSAR Color Guard Commander; Unknown, Linda Stewart, Major General Fred Kaffenberger, KSSSAR Color Guard Commander, Kathy Morrison, Captain James L. Scott, and Carolyn S. Grover.